PactSafe is a contract acceptance solution for high-velocity businesses offering modern signing methods like eSignature, text-to-sign, click-to-sign and SmartPacts to create instant, legally enforceable records. PactSafe provides scalable contract acceptance that protects businesses from legal issues before they arise, while preserving the experience and speed of buying processes within high-velocity companies. Organizations can make contracts a seamless part of their business through PactSafe's comprehensive click-through agreements. With PactSafe, users can design a simple, standardized agreement completely powered by data from Salesforce, their rep, or apps they choose to plug the platform into such as Microsoft Dynamics, Intercom, Slack, and even Zapier. PactSafe enables users to prepare both standardized and personalized contracts at any scale to record legally enforceable data and terms. Sales contracts, business terms and conditions or employee notifications can be delivered via multiple channels such as email, SMS texts, or live chat for instant acceptance. Users can also monitor the status of contracts, publish instant updates, and retrieve records anywhere, anytime. The tool is good for the purposes we intended it for. It helps take care of legal docs management. It's been reliable and makes it easy for my clients to partner with us.It's easy to navigate and the PactSafe team has taken constructive feedback to help personalize our setup. The PactSafe support has been responsive, even on weekends and holidays. It's easy to navigate and the PactSafe team has taken constructive feedback to help personalize our setup. The PactSafe support has been responsive, even on weekends and holidays. I ran into some sending/receiving issues when we first launched with PactSafe. Some clients didn't receive their agreements. Some notifications still show that a client hasn't "received" the agreement to their email - when in fact they did. It can seem unprofessional when reaching out multiple times to see if they received it, and contacting pactsafe to ensure it was successfully sent - even though the notification tells you otherwise. - This is not always the case, and usually only happens when the "receiver's" inbox/server is full. Can't think of anything at the moment. I would say assigning contacts to signature fields is tedious, but, through their support team, I figured out that you can assign all. Con be gone! Very quick and easy way to paperlessly send and sign contractsThe prospects can sign an agreement with 1 click of a mouse. Everything is paperless. The end users can review / print / and sign the agreement all online. The prospects can sign an agreement with 1 click of a mouse. Everything is paperless. The end users can review / print / and sign the agreement all online. The email notifications send automatcially to remind them to sign the document. This was a problem as some prospects would tell us "this will take 3 weeks" and the system would auto send emails reminding them to sign the contract. Some prospects would get annoyed saying " I told you it was going to be 3 weeks! Stop sending me reminders" NOTE: worked with customer service and they were able to turn these off. PactSafe has made business so much more efficient, being able to send paperwork electronically. Instant alerts when paperwork is complete, easy for new users to understand, and rarely has lag-time. It can be very tedious adding the text fields to contracts. I would also like to see an option for making check boxes mandatory to choose one option. • Eliminate complexity while managing legal risk with PactSafe's fully digitized, frictionless contract acceptance experience. 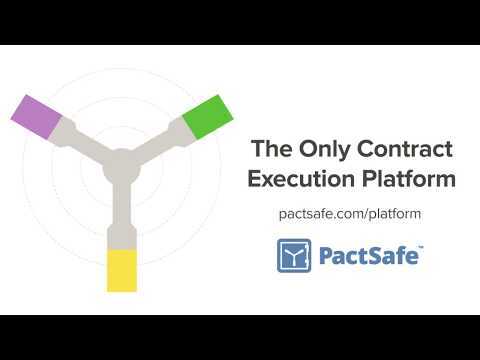 • PactSafe offers a myriad of ways to execute contracts which help to eliminate bottlenecks, empower legal teams with full control, and can even enable sales teams to close deals quickly. • Companies can build frictionless processes integrated with the apps they already use, and deliver sales contracts, business terms and conditions or employee notification for acceptance through email, SMS texts, or live chat. • PactSafe helps protect your business from legal issues before they arise, for improved confidence in contract acceptance. • Make legal agreements simple, digital, repeatable, and automated as you scale, and tailor them to your business processes. Below are some frequently asked questions for PactSafe. Q. What type of pricing plans does PactSafe offer? Q. Who are the typical users of PactSafe? Q. What languages does PactSafe support? Q. Does PactSafe support mobile devices? Q. Does PactSafe offer an API? Yes, PactSafe has an API available for use. Q. What other apps does PactSafe integrate with? Q. What level of support does PactSafe offer?